This entry was posted in News on February 6, 2011 by Sabrina Lastman. 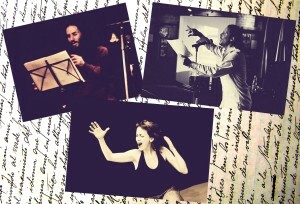 Performances by Sabrina Lastman, Marcelo Toledo, Marcos Wasem, Ernesto Estrella & Aldo Mazzucchelli on texts by the Uruguayan Modernist Julio Herrera y Reissig. This entry was posted in News on January 22, 2011 by Sabrina Lastman. 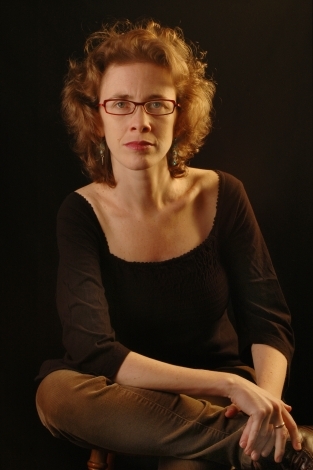 River of Painted Birds by Sabrina Lastman is a new work commissioned by NYSCA to be premiered at VITAL VOX. This music performance is created for solo voice (sung & spoken), and prerecorded voice & sound tracks (tape recorder/walkman, computer) combining composed sections and free improvisation. It looks for a musical balance among elements of jazz, experimental and contemporary music. This new piece is inspired by the poetry and texts of writers and thinkers –ex-political prisoners– that created their work as a consequence of the repression during and after the dictatorship period of the seventies in Uruguay. 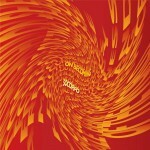 River of Painted Birds was created on Ubuntu (OS) using Linux, SooperLooper, Ardour, Jack, and Ladish programs. This entry was posted in News on November 21, 2010 by Sabrina Lastman. VITAL VOX: A VOCAL FESTIVAL explores the myriad power of the human voice in its solo and ensemble forms across a multitude of genres. This three day festival is in its 2nd annual appearance and will occur on November 11, 12, and 13 2010 at 8:30pm at the ISSUE Project Room at the Old American Can Factory, 232 3rd Street, in Brooklyn, NY. (F/G Subway to Carroll St or F/M/R to 9th St./4th Ave.) Tickets are $10 ($9 in advance) and ca…n be purchased at www.issueprojectroom.org or by calling 718-330-0313. 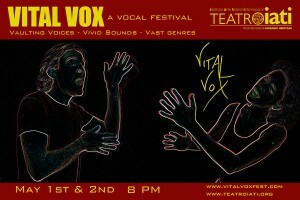 VITAL VOX (www.vitalvoxfest.com) celebrates composer-performers in the vocal arts who stretch and expand the voice in new and original ways, continuing a strong contemporary tradition developed in the United States. With international influences springing from such countries and regions as Taiwan, East Timor, Slovakia, Africa, South India, and more; genres ranging from jazz, experimental, contemporary, free improvisation, “noise” music, and abstract solo opera; and themes ranging from “maintaining one’s composure”, to cinematographic music theater inspired by the life, films and death of the German filmmaker Rainer Werner Fassbinder, VITAL VOX has wide ranging scope and appeal. 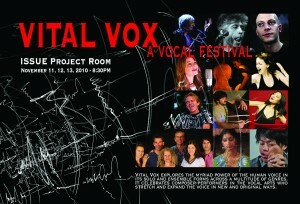 Tickets are $10 ($9 in advance) at www.issueprojectroom.org or calling 718-330-0313. This entry was posted in News on October 17, 2010 by Sabrina Lastman. On Becoming is an original music theatre work for two a cappella voices, recorded music, electronics, and live instruments. This work explores the dimensions and dynamics of the self, and its perpetual capacity of transformation. 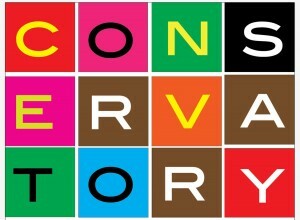 Presented by SoCorpo (www.socorpo.com). Ear ♥ Music is where New Yorkers can get their aural fix. Featuring some of New York’s most cutting edge performers, composers and programming, this is a modern chamber music series presented to an intimate crowd. We believe that audiences want to be engaged – not simply entertained – by the music they go out to hear. We nurture our listeners by presenting repertoire that is challenging yet relevant, and by providing context for our work. Ear ♥ Music:Makers opens discussions about the art-music of now taking the work of interviewed composers as a starting point. These events also include live performance. The Tank is located at 354 W 45th St, New York. This entry was posted in News on September 8, 2010 by Sabrina Lastman. On Monday, September 6, 7:30 pm we’ll be playing with the Sabrina Lastman Quartet at Joe’s Pub for the first time!! 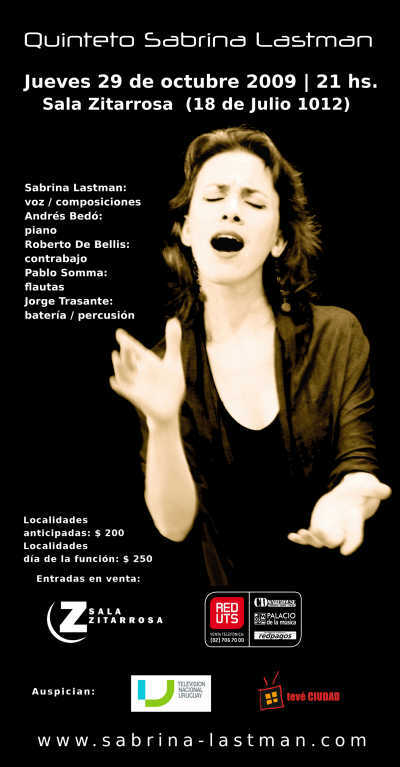 SLQ: Sabrina Lastman, Emilio Solla, Pablo Aslán, David Silliman and guest musicians TBA. 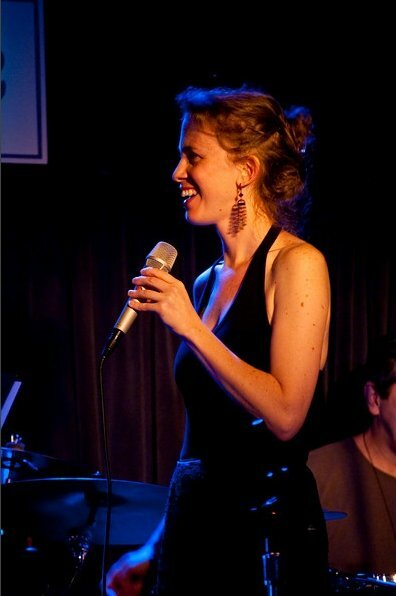 This entry was posted in News and tagged David Silliman, Emilio Solla, Joe's Pub, Pablo Aslán, Quartet, Sabrina Lastman on July 22, 2010 by Sabrina Lastman. SoCorpo, the vocal ensemble comprised of Sasha Bogdanowitsch & Sabrina Lastman, will present On Becoming at La Mama Moves Festival on Fridays June 11 & 18 at 10 pm. 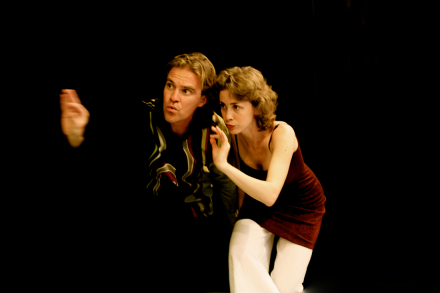 On Becoming is an original music theatre work for two a cappella voices, recorded music, electronics, and live instruments. This work explores the dimensions & dynamics of the self, and its perpetual capacity of transformation. This entry was posted in News on June 7, 2010 by Sabrina Lastman. 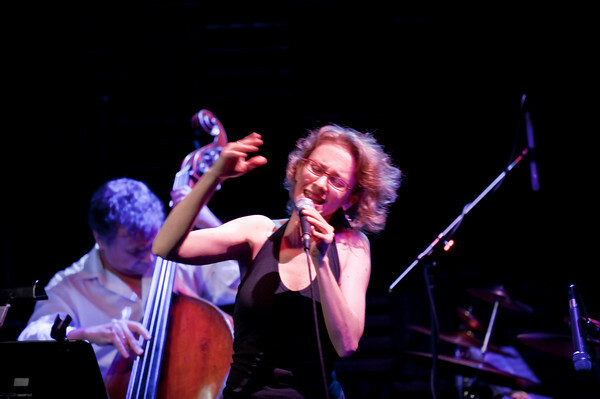 The Lower Manhattan Cultural Council (LMCC) and New York City Department of Cultural Affairs awarded Sabrina a 2010 Manhattan Community Arts Fund grant to support the Sabrina Lastman Quartet. This entry was posted in News on January 29, 2010 by Sabrina Lastman. 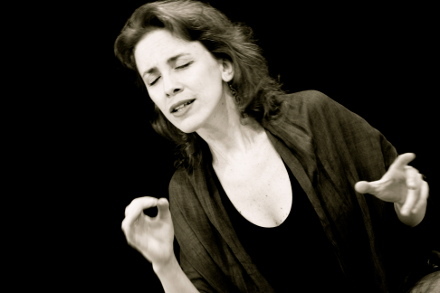 This workshop focuses on the development of the voice through breathing, body awareness and voice technique (pitch quality, range, support -physical strength-, emission & intonation). During this process we’ll work on collective singing, individual song interpretation, sound exploration and voice improvisation. Through work on body releasing and voice technique, we bring our body/mind to a state of open and creative presence. Open to all levels. This entry was posted in News on December 21, 2009 by Sabrina Lastman. Music with a View. Singing compositions by Sasha Bogdanowitsch. 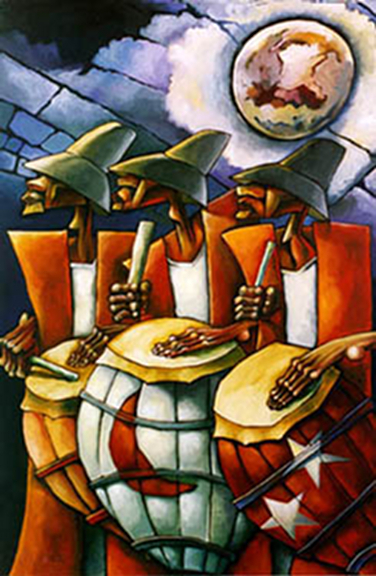 Candombe Jazz Project performing at the Heckscher Theatre. 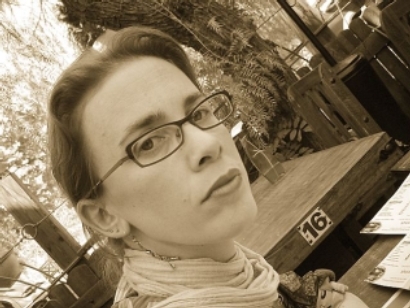 Dialogues of Silence, by Sabrina Lastman, is an interdisciplinary performance based on the poetry and inner world perception of Uruguayan poet Idea Vilariño. 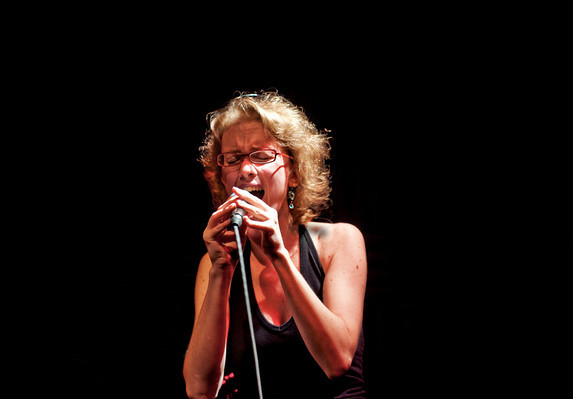 It consists of a solo vocal artist who translates the poetic atmosphere into a dance and sound experience. Readings in Spanish. Reception to follow. Co-sponsored by NYU’s MFA Program in Creative Writing in Spanish, Department of Spanish and Portuguese. This entry was posted in News on October 29, 2009 by Sabrina Lastman. Sabrina will perform in Montevideo and Buenos Aires, October / November 2009. Wednesday, October 28th. 2009. 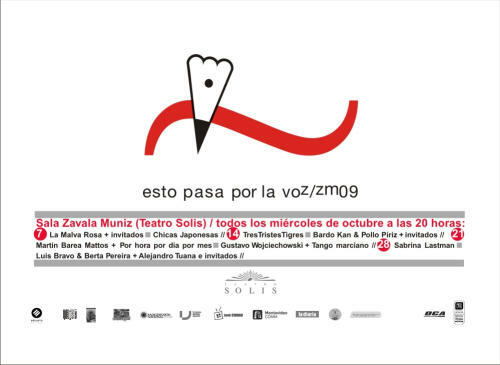 Teatro Solís, Sala Zavala Muñiz, 8:00 p.m.
Saturday, November 7th. 2009, 11:30 p.m. This entry was posted in News on October 22, 2009 by Sabrina Lastman. 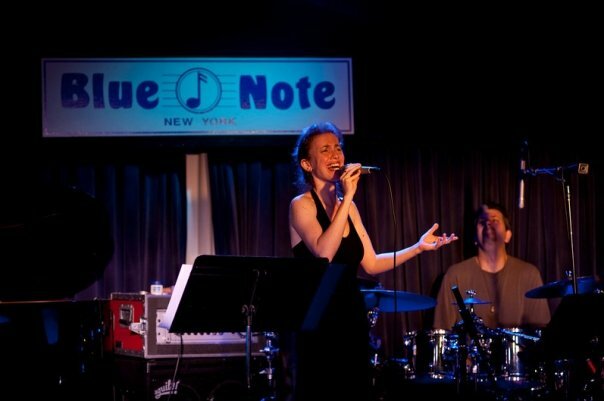 On Sunday, July 5 will be performing for the first time at the legendary Blue Note with the Sabrina Lastman Quartet. Two sets: 12.30 and 2:30 pm. For reservations ,visit this page. This entry was posted in News on May 28, 2009 by Sabrina Lastman. This entry was posted in News on May 10, 2009 by Sabrina Lastman. Vital Vox: A Vocal Festival explores the myriad power of the human voice in its solo and ensemble forms across a multitude of genres. 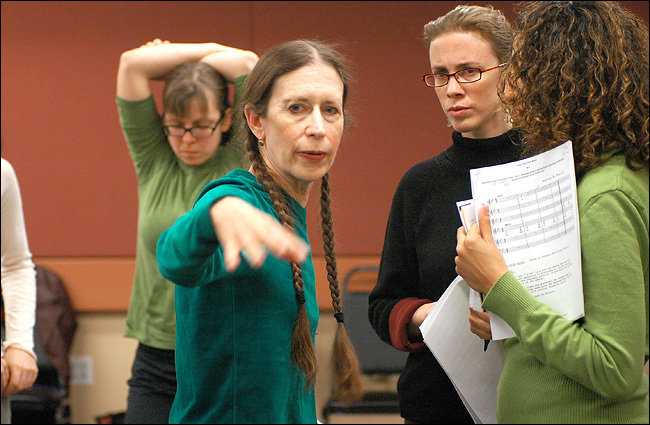 This two day festival celebrates a new generation of young vocal artists creating and performing their own original works and those of American masters, like Meredith Monk and John Zorn. 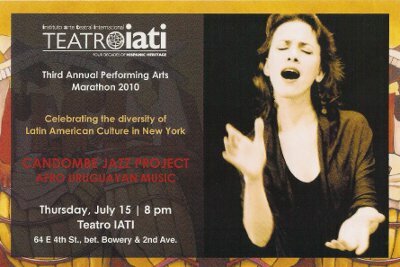 Teatro IATI 64 East 4th Street, bet. Bowery and Second Ave.
Subways F to 2nd Ave, 6 to Astor Place, R and W to 8th St., M15 Bus to 2nd Ave. and 4th St. This entry was posted in News on March 26, 2009 by Sabrina Lastman. This entry was posted in News on January 8, 2009 by Sabrina Lastman. 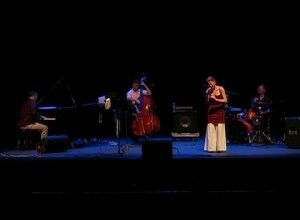 w/ Eddy Khaimovich (double bass), Quintino Cinalli (drums and percussion) and Emilio Solla (piano).